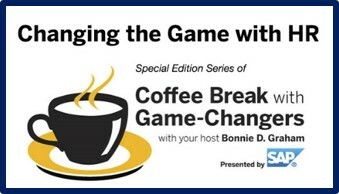 This episode is part of a 10-episode SAP SuccessFactors radio series that started on January 19 and will continue to air every three weeks on Thursdays at 11 AM PT / 2 PM ET on the VoiceAmerica network Business Channel, SAP Radio Changing the Game with HR. The series will run through August. All shows will be recorded and available for download or live playing via the website. Our first show started with the big picture in mind: “Core HR: Changing the Conversation” and is available here. You can’t be global without being local. One of the first considerations for any CHRO is compliance. Compliance to local customs. Compliance to local and global business regulations. Compliance to legal practices. And, compliance with local and industry best practices. While this transactional component is important and necessary, it does not fully explain how HR can create a brand-based experience that translates policy to practice… all the while holding people at the center of globalized business with a local feel. And, don’t even mention the risks. No wonder this topic keeps CHROs awake at night. A country can shut a business down if a company does something that conflicts with local rules and regulations. The workforce is more global than ever. According to a McKinsey report, 46% of the Forbes Global 500 will be based in emerging markets by 2025, up from 17% in 2010. This requires the HR department to manage issues and people in all the countries where they do business. Policies, practices, tools and programs must be able to accommodate localized, country-by-country knowledge, processes and customs that make sense to local members of the workforce and global leaders. The opportunities to thrive instead of survive are dependent on breaking down siloes. HR has the opportunity to move beyond delivering on local compliance (a feat unto itself) by adding value to the business through a truly global people strategy and operations: managing data across Core HR, talent management and other business applications enables HR and business leaders to gain deeper insights that fuel better strategic planning and HR implementation. How does digitalization impact HR’s ability to deliver services to global business leaders and the local workforce. Join host Bonnie D. Graham as she talks with Nicole Sahin, CEO and founder of Globalization Partners, ranked number 6 on the 2016 Inc. 5000’s fastest growing companies, and Barbara Ocain, Global Executive Advisor | HR Strategy & Transformation, SAP. To learn about transforming HR for the digital workforce go www.successfactors.com.